At annual digital summit in Rishon Letzion former Defense Minister explains Israeli policy regarding military conflicts in region. 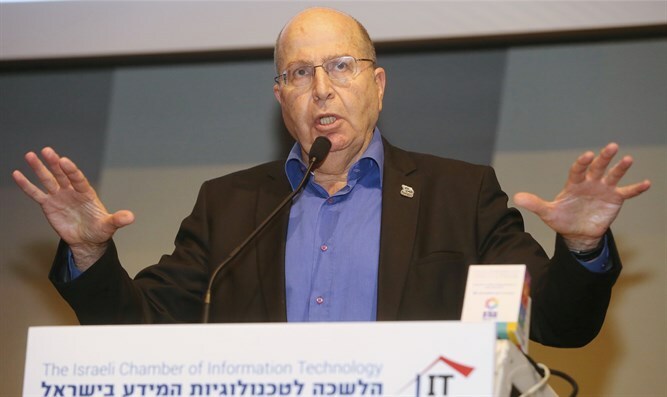 Former Defense Minister and Chief of Staff Moshe Yaalon participated in yesterday's annual digital summit held in Rishon Letzion. "Israel's made a number of wise decisions: Not to interfere in internal conflicts and to set red lines. Today the struggle over the future of Syria and the struggle against Iranian presence there threaten us," Yaalon said. "It's necessary to have as little talk as possible and to wield a club when necessary. In the Middle East, without a big and effective club, you don't survive. This, along with carrots such as humanitarian aid," explained Yaalon. "Managing foreign policy in the Middle East is first of all interests, and when we correctly identify interests, such as a common enemy, we can establish a reasonable relationship with reasonable security. This is our situation today, and I hope it will continue," he said. "One of the most important things that happened to Israel is that it's become a superpower, not just a security one, and its security depends not only on technology," Yaalon said, referring to Israel's technological strength. "Many are appearing at our door. Israel is the only one in the area where there's always water flowing in the faucet. We have expertise in water for agriculture, desert agriculture, and desalination. Technology, with all the dangers inherent in it, is an asset for us." "When I was Chief of Staff," Yaalon said, "I set up the computerization department, with the understanding that IT has the ability to be a multiplier of operational power, and when you have it, you are courted. It's a source of power, also economic."